Academic writing has a different tone and style than everyday writing. Here are some of the main characteristics of writing academically. Unless you are an expert on the topic, it is best to avoid using the first person when writing academically. When you have strong evidence to support your argument, you can successfully use the more confident tone of the third person. The exception to this is reflective writing, which is always written in the first person. Contractions: Contracted forms of English; didn’t, isn’t, couldn’t, wouldn't , are not accepted in formal academic writing. Slang: Always avoid using slang language (“the kids”, “arvo”, “drunk”). Over-complicated language: The more concise and simple the language, the more persuasive it can be. Only the facts should be written and emotional content should be avoided as should flowery language, adjectives and jargon. 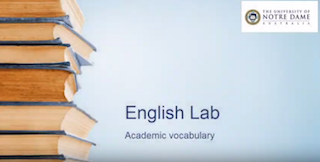 What kind of vocabulary is 'academic'? Watch this video to ensure your writing style is appropriate for university. Read assignment instructions carefully to determine the type of academic writing that is expected, as well as directions for layout, word count and structure. Here are some overviews of the main academic writing types you may encounter. Essays establish "a case" and prove it as fully and convincingly as possible by weighing the evidence. Simply put, an essay persuades readers of an idea, based on evidence. Reports are defined by highly structured, concise and targeted writing for a specific audience. Reports tend to present a problem or issue, analyse the facts involved, and propose solutions, using relevant research as evidence. Report headings vary but usually include an introduction, findings or results, discussion, recommendations and references. Literature reviews identify and evaluate the current state of knowledge on a topic, including findings, controversies, conflicts and emerging trends. You don't need to find everything that has been written - instead, include work that is notable in that particular field. "Literature" can include journal articles, government documents, presentations, reports and other works (Monash University, 2019). Annotated bibliographies are about identifying and briefly analysing literature on a topic. Annotated bibliographies include the reference to the work itself, followed by a brief summary and analysis for each one. Reflective writing is a less formal process which can involve identifying feelings and evaluating and analysing experiences. It helps clarify your response to an experience, and reflect on mistakes and successes. It is written in the first person, and may pose questions that have no immediate answers. Examples of how to write the most important sections of a report. Outline of what to include in a literature review. Examples of how to structure the main points in an essay. Outlines how the reflective writing process works, and provides examples of what it looks like. See the Before You Start Writing page to learn more about these steps. The introduction tells the reader what your writing is about. Start by defining the topic and any terms which will be crucial for your discussion. The introduction should also state what position you will argue and how you will do it. Use words and phrases which are in the assignment question to help the reader see that you are directly addressing the main issues. It can help to write the introduction last. This is particularly helpful if you have not yet fully determined what your document is going to say and what your arguments will be. This is the most important part of your writing. Begin each sentence with a "topic sentence" which is then discussed and explained. Each paragraph must discuss a different point. Each paragraph should be a discussion on the point you have made in the first sentence. Paraphrase or summarise the sources you have read in your research. If using direct quotes, ensure they are relevant and impactful. Evaluate what is being said. Never assume the reader knows what you are talking about. Always reference any ideas you have used in your writing. See the Paraphrasing, Summarising and Quoting page for more information. Paragraphs should flow in an organised and logical sequence. One way to do this is by introducing the next paragraph (topic) in the last sentence of the previous paragraph. Avoid repetition and rewriting another version of what you have already said. Transition or linking words, such as however, therefore, and although tell the reader about the direction you are arguing or when there is a change of direction. Avoid using first person point of view. Avoid slang or jargon (use academic language). Avoid using long and complicated sentences. Make your point obvious and easy to read. The work should read as one organised discussion, not a mix of unrelated information. Make sure each sentence in the paragraphs has a role in the discussion and contributes to the overall argument and topic you are addressing. Restate what you planned to do in your introduction and discuss how you have done it. You should tell the reader that your discussion led to the conclusion that your thesis (argument/position) supported. No new information should be included in the conclusion. 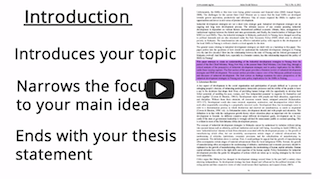 How to structure a research paper or essay. You are required to produce an argument in almost every form of assessment at university. The word "argument" goes much further than a disagreement - there must be an attempt to persuade and convince the reader of your position. Words and phrasing (verbs/operative words) such as “discuss”, “analyse”, “evaluate the claim”, “critically evaluate”, “to what extent” are all alerts to the need for an argument. Arguments must have reasons, and are meant to be persuasive and convincing (Brink-Budgen, 2000). A basic argument consists of a position statement, linked to a series of supporting points. For example: “The Lord of the Rings is a great film because the story is riveting, the characters are brilliant and the settings spectacular” (Turner et al., 2008, p. 90). “Some people do not like The Lord of the Rings (opposing point of view), as it is very long (supporting point for the opposing point of view). However, despite its length, it is a great film (author's position) because the story is riveting, the characters are brilliant and the settings spectacular (supporting points for author's position)" (Turner et al., 2008, p. 90). Your writing should contain references either in the text or as footnotes depending on the referencing style used. There should also be a more detailed reference list or bibliography at the end of the document. Please see the Library's Referencing Guide for more information on how to apply a referencing style to your work. For information on how to paraphrase, summarise and quote, please see that section of the guide. Print your work before you check it. Your writing looks different on paper and you will often pick up errors that you did not see on the screen. Read it out loud and see how it flows. Is it a well presented argument? When so much time is spent on an assignment, your editing skills become shaky. Give yourself a break and come back to it fresh. This is why it is so important to finish your work well before the due date. Ask a friend or family member to read your work. You will get their opinion and the goal is for them to understand your essay without any prompting or explanation from you. Check the presentation and formatting to ensure it meets the requirements of your School. These can be found on the course outline or on Blackboard. Check that you have referenced correctly and included all research used in your essay to avoid plagiarism. Does my writing have the correct sections and headings? Does each paragraph have a topic sentence which states the main idea and is then explained? Have I included enough facts, examples and illustrations to support my point clearly and thoroughly? Is my writing clear or will the reader be confused when they read it? Have I chosen a point of view and stayed with it? Do all my sentences and paragraphs contribute to the argument? Have I used adequate and quality sources and referenced them correctly? Brink-Budgen, R. (2000). Critical thinking for students. (3rd ed.). Oxford, UK: How To Books. Turner, K. (2008). Essential academic skills. South Melbourne, VIC: Oxford University Press.